By a popular vote, last night the Democratic Party of Sacramento (DPSC) decided against endorsing Steve Ly in his reelection bid for mayor of Elk Grove. Ly, who was first elected to the Elk Grove City Council in 2014 and is seeking a second two-year term as mayor. After interviewing the candidates, the executive board of the DPSC had recommended endorsing Ly over his two Democratic challengers, Tracie Stafford and Elk Grove Vice Mayor Darren Suen. The item was placed on the consent calendar but was removed for further consideration. Ly and Stafford both were given an opportunity to make their pitch to the voting members. Suen did not attend the meeting. Each candidate also had floor speeches made on their behalf. In his presentation, Ly characterized the work he had done for the city, and before that the Elk Grove Unified School district before that as "groundbreaking." Ly also stressed that he was the only current member of the city council who supports by-district elections. "I served as the mayor of Elk Grove for almost two years now, and before that, I was the vice mayor, and before that, I was a council member and school board," he said. "I have a long history of service." During her speaking opportunity, Stafford noted the city continues to grow, but the current city council is not focused on providing services for existing residents or addressing the problems created by the growth. Among the concerns she cited were compounding vehicle traffic in the community. "We go 46,000 more people coming into Elk Grove, yet are traffic can't accommodate those that we have there night now," she said. "And we have an environmental study that was done in 2004." Stafford also touched on last year's race problems in Elk Grove. Among those problems were a hate message left at an Old Town Elk Grove African American-owned business and a hate viral hate video from Pleasant Grove High School. "We have made national news for our racism," Stafford noted. During floor speeches, Maureen Craft and Andres Ramos spoke on behalf of Stafford and Ly respectively. Craft ran for the Elk Grove City Council District 3 seat against Steve Detrick in 2016 and Ramos is currently challenging Elk Grove Council Member Pat Hume for the District 2 position. Craft reminded the audience that during her 2016 campaign against Republican candidate and incumbent Detrick, Ly did not support or endorse her candidacy as a fellow Democrat. "In 2016 there was an opportunity to work [for Ly] with me, but he worked against me," Craft stated. "As a Democrat, that is not how we grow." Speaking for Ly, Ramos noted the two had a long history and acknowledged he supported Ly's 2014 city council challenger, Nancy Chaires-Espinosa. He went on to say Ly represents the best opportunity for changes in Elk Grove. "He can govern and bring progressive change to Elk Grove," Ramos said. 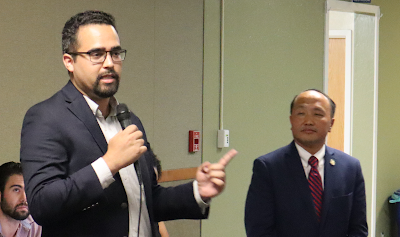 Ramos also took the opportunity to criticize Ly's two Democratic city colleagues, Suen and Stephanie Nguyen, but not by name noting their endorsements in the June primary. He also told the audience Nguyen and Suen had teamed with Republicans Detrick and Hume to oppose Ly. "By the way two Democrats that supported [Sacramento County District Attorney] Ann Marie Schubert," Ramos said. "Democrats that are supporting my Republican opponent right now." After the speeches, members voted 33 yes to affirm the recommendation, 33 no to rescind it, and one abstention. Because the vote did not exceed the 60-percent threshold, the recommendation to endorse Ly was killed. Another floor motion asked for a vote to recommended Stafford, but that vote did not reach the 60-percent threshold either. The club did not offer any endorsement for the Elk Grove mayoral contest. In other actions, the executive committee's recommendation to endorse Ramos in his run against Hume, and Orlando Fuentes candidacy against Nguyen were adopted. Also receiving endorsements for the Cosumnes Community Services District Board of directors race were Jaclyn Moreno and incumbent Rod Brewer. To fill a vacancy created by a recent resignation, by a majority vote members elected Kendra Lewis, president of the Elk Grove-South County Democratic Club, as vice chair of the DPSC. Lewis was challenged by Mikey Hothi, a field representative for Assemblymember Jim Cooper.